You never know what’s going to happen at Talladega — and that’s not a spotter-less Brad Keselowski reference. Few expected nearly two-thirds of the field to get wiped out in crashes, including eight of the 12 remaining playoff drivers, but it happened Sunday. Here’s what was good and bad about 500 miles at Talladega to mark the halfway point of this year’s playoffs. If there’s a place you want to know what’s going on around you, that place is Talladega. It’s the biggest track on the circuit and close draft packs make constant spotter communication more than vital. Eventually, Keselowski pitted to have the antenna replaced on the roof of his car. (Yes, NASCAR race cars have antennae.) And, of course, he drove his Ford to Victory Lane — aided, of course, by spotter communication in the end. It’s tough to decide whether or not Keselowski and the No. 2 crew deserve a thumbs up or thumbs down for racing at the most spotter-intensive track on the circuit, but we’ll give ’em a thumbs up for doing the unthinkable. Talladega’s a frustrating place, especially when you’re not running well. Clint Bowyer, unable to continue after his No. 14 Ford was overcome by crash damage, took his frustration out on his pit crew following his exit from the race. Maybe there’s an explanation for this. Thumbs down for getting frustrated with your crew. They’re the group that has your back. Even though Dale Earnhardt Jr. didn’t score his seventh victory at Talladega, he had quite a race. … it was an impressive effort for Junior in his final restrictor plate start. Unfortunately, he was slowed on the final run due to a dragging splitter (his arch nemesis), relegating him to a seventh-place finish in his last time at Talladega — but it was certainly an eventful day. Thumbs up to the man who will forever be The Pied Piper of restrictor plate racing. 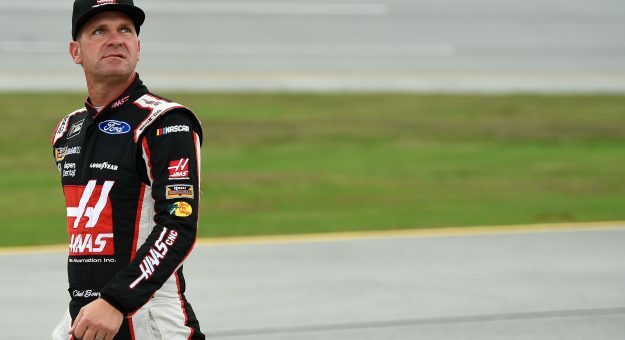 The Alabama 500 was slowed 11 times Sunday, mostly for multi-car crashes including a wreck that claimed more than a quarter of the field after Martin Truex Jr. and David Ragan tangled. Thumbs down for tearing up lots of cars. Thankfully, everyone was OK, physically, at least, though Talladega will certainly have an impact on the playoff picture moving forward. In the end, just 14 cars finished the race and only 12 remained on the lead lap. Maybe that’s why it’s called the Round of 12. It’s only fitting to crown a new king of restrictor plate racing following Earnhardt’s final restrictor-plate race. Keselowski — yes, spotter-less Keselowski, who drove a paint scheme honoring Earnhardt — pulled off his fifth victory at Talladega. Just getting service, thank you for all the kind messages! Keselowski’s win, and resulting lock into the Round of 8, seems to have a benefit for everybody.